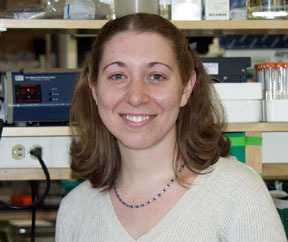 My project focuses on the role of the chromokinesin, Kid, in metaphase chromosome alignment in mammalian mitosis. We have shown that the human Kid protein is required for the generation of the polar ejection force--the away-from-the-pole force that acts on chromosome arms in mitosis--but is not essential for chromosome congression to the metaphase plate (Levesque and Compton, 2001 J. Cell Biol. 154(6)1135-1146). We are currently investigating the existence of redundant mechanisms that may help direct chromosome alignment in the absence of polar ejection forces. Fig. 1 (Eg5/Kid) Kid is required for generation of the polar ejection force. Human CFPAC-1 cells were microinjected with antibodies against either Eg5 alone (A) or both Eg5 and Kid (B) and were fixed and processed for immunofluorescence at least two hours after mitotic entry. 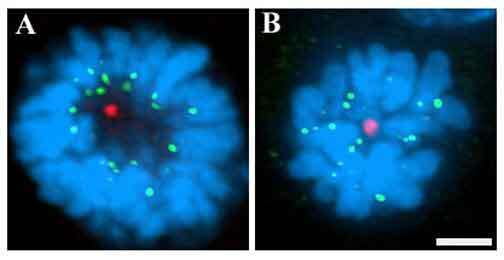 Merged DNA (blue), centrosome (red), and centromere (green) images are shown. In cells injected with Eg5 specific antibodies alone (A), chromosomes are maintained away from the pole with their kinetochore regions pulled poleward and their arms pushed away from the pole. In cells coinjected with antibodies specific for both Eg5 and Kid, chromosomes cluster close to the pole indicating a loss of polar ejection force on chromosome arms. Fig. 2 (NuMA/Kid) Coinjection of NuMA- and Kid- specific antibodies leads to formation of bipolar spindles which are significantly shorter than control spindles. Human CFPAC-1 cells were microinjected with antibodies against both NuMA and Kid and were fixed and processed for immunofluorescence at least two hours after mitotic entry. 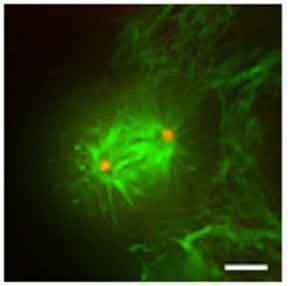 Merged DNA (blue), tubulin (green) and centrosome (red) images are shown. In contrast to cells injected with NuMA-specific antibodies alone, cells coinjected with NuMA- and Kid-specific antibodies form spindles with organized poles. These spindles, however, are ~42% shorter than control spindles. Additionally, while cells injected with either NuMA- or Kid-specific antibodies alone have tightly aligned chromosomes, cells coinjected with NuMA- and Kid-specific antibodies have a much wider distribution of chromosomes at the metaphase plate.